Concern continues about flooding on the northern end of the Dalton Highway. Water from the Sag River overran the Dalton south of Deadhorse last year, causing extensive damage that closed the road for weeks. Mitigation work is aimed at reducing impacts of encroaching ice and water. A severely impacted stretch of the Dalton Highway between mileposts 397 and 405 was raised last summer, and State Department of Transportation northern region spokeswoman Meadow Bailey says a flood barrier was built this winter from mile 394 to 397. ”A three-mile, five-foot tall, gravel berm essentially, on the east side of the road to protect the overflow from reaching the road,” Bailey clarified. Bailey said additional work on the Sag River ice is ongoing. “Trenching the channels keeping them open as opposed to freezing and backing up which is what we experienced last year,” said Bailey. Bailey said water has risen along the highway, but so far not breached the road. Bailey says last year a rapid melt out sent a high volume of water into the river plain, overrunning several sections of the road. 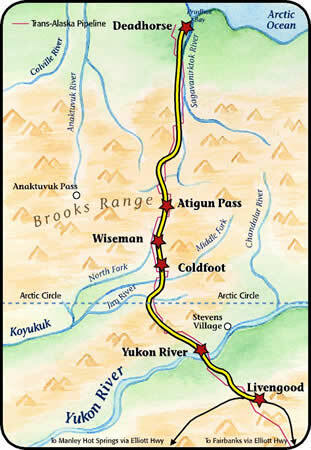 The northern end of the Dalton Highway has long suffered overflow and flooding problems, and more work is planned for this summer to elevate low lying sections.